It’s hard to argue that adverse weather is a not problem for weather dependent energy sources. Just hope the UK learns from this. Interesting how the BBC described it as unprecedented – surely their favourite word is misplaced given this has happened before? I am guessing by now that most environmental correspondents “E” key will be completely warn out. SA’s operatives tell us the blackout occurred during a blustery spring storm (heavy rain, lightning and surging, gusty wind). 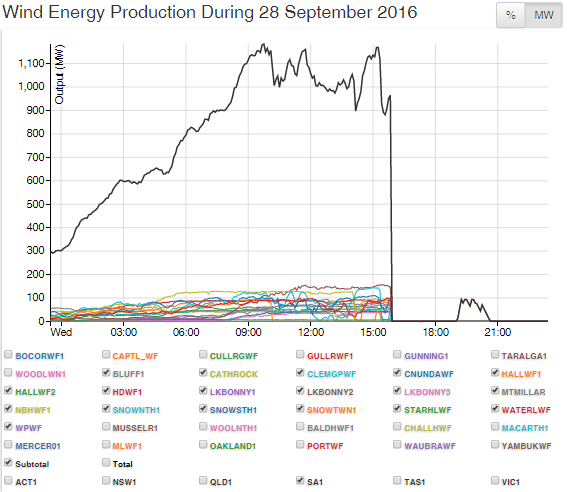 The power supply went down across the entire State at precisely the same time (a little after 3:30pm). It took more than 5 hours to restore power to a few parts of the State, and many regions remained powerless for much longer than that. As you may be aware, a new group known as Clexit has recently been formed. Its aim is to campaign for countries either to refuse to ratify the Paris Agreement, or withdraw from it. Clexit is already formed in 25 countries. One of the aims is to produce a well written case against ratification in each, and therefore I have drafted one for the UK. Any comments would be welcome, and will be considered for final inclusion. a) I do not want it to be summarily dismissed as the work of a “denier”. b) The scientific case deserves to be presented in its own right, and preferably written by someone better qualified than me! 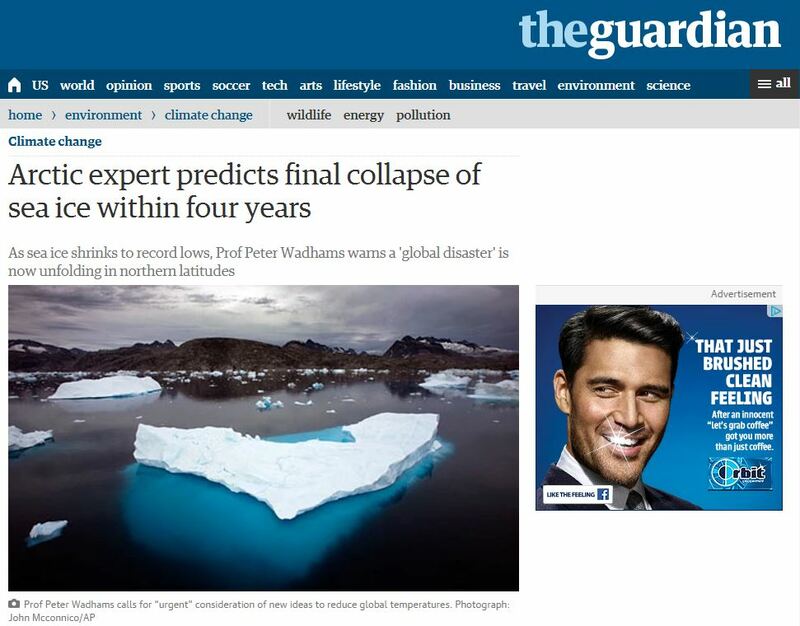 Time’s up, so-called Professor Wadhams. 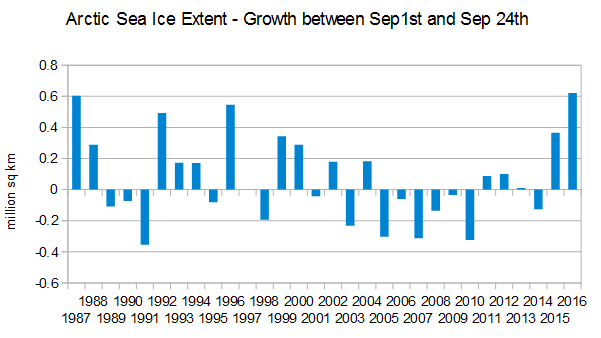 Dodgy NSICD press release covering up record early minimum arctic sea ice? The Arctic sea ice looks to have reached its minimum on the 7th September, which is four days earlier than average. 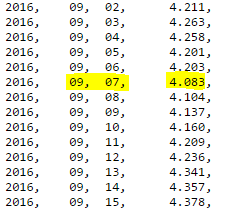 The sea ice extent bottomed out at 4.083 million square kilometres making it the second lowest since records started in 1978 – well that’s according to the data file that I’ve just downloaded! 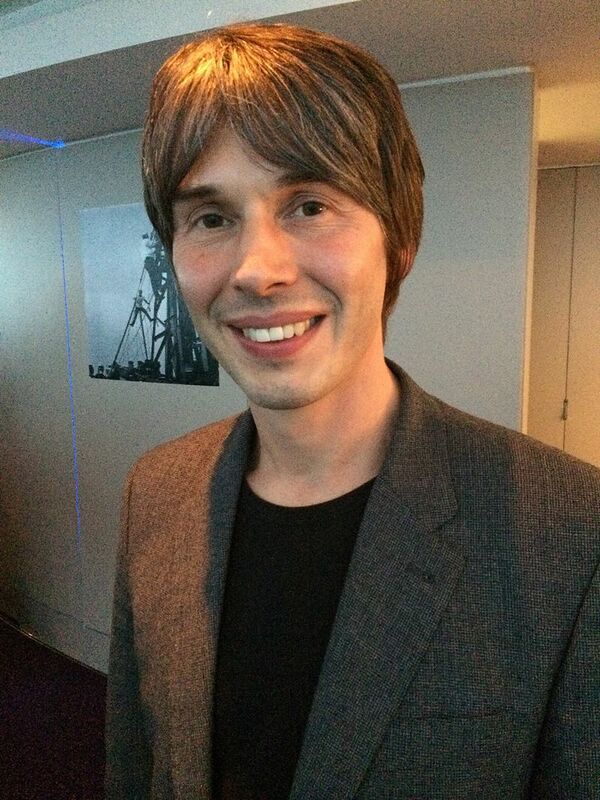 On September 9, 2016, Quadrant Online published the following open letter from Graham Woods to Brian Cox. Grahan Woods is an Australian PhD. I’d appreciate your response to this email, which deals with your recent appearance on the ABC’s Q&A program. First, I want to make it clear that, where you’re concerned, I’m not a ‘vexatious invigilator’. My wife and I (each with an earned PhD) have watched most of your TV programs, and have been struck by their intellectual clarity and your unassuming personal style (as well as by your BMI: we’re high-level wellness devotees). With that said, we both have serious misgivings about your recent appearance on Q&A.